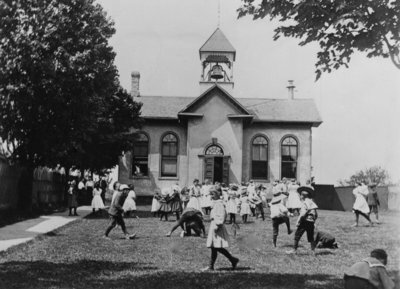 Education in Richmond Hill and district has a long and interesting history – one which goes back to the year 1810 when Yonge St. was still nothing more than a pioneer trail. In that year the first school was established in an abandoned settler's building made of logs and with a mud floor. The land on which it stood was donated by Mr. James Miles, the first owner of Lot 46. A school proper was built around 1820. This was a hewed log structure about 20x40 feet, chinked with mud. It stood a short distance south of where the present Public School (The McConaghy school in 1957) stands. Mr. Benjamin Barnard was the first school master. He was paid the princely salary of twelve dollars per quarter, and board around two weeks with a family. He was his own truant officer, and also acted as village moral guardian in the evening. In 1849, this school’s first brick successor was erected. We are told that there was a great cry at this time at the extravagance of the trustees in building such a pretentious building. This school served the area until 1915, when the main part of the present (McConaghy in 1957) school was erected, at a cost of $26,000. The residents of Richmond Hill were very proud of this building which was considered the best in the county outside of the city. Mr. George Cowie, Chairman of the Board of Education presided at the opening, and speeches were given by the four resident clergymen, namely Revs. R. Herbison, J.R. Aikenhead, S.A. Lawrence and Father Kelly. The Board of Education at this time was composed of the following members – G. Cowie, G. A. McDonald, F. McConaghy, Geo. Redditt, Т.Н. Trench, D.Hill, Wm. Harrison, W.A. Wright, H. A. Nicholls, Geo. Harding, J. Innes, J. N. Boyle and C. Mason. The teaching staff was as follows: Mr. A. E. Lehman, Principal, Miss M. Trench, Miss E. M. Holmes and Mrs. McConaghy. Owing to increased population, a new and modernly equipped four-roomed addition with an auditorium seating three hundred people was opened on November 1, 1948. In the 1880s, there were two private schools in the village: one Yonge St. taught by Miss Campbell, located a short distance north of the Methodist Church, and one on Richmond St. taught by Mrs. O’Brien.